Offers seven hiking trails, a six-acre lake and two spectacular waterfalls make Cliffside Lake Recreation Area and Van Hook Campground a mecca for those who enjoy the outdoors. Camp, swim and hike within a two-mile radius. 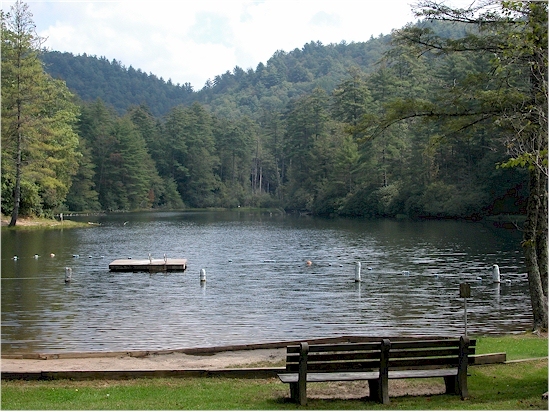 Cliffside Lake Recreation Area offers two covered picnic shelters that must be reserved, a bathhouse with cold showers, a lake for fishing and swimming, a gazebo and six short hiking trails. Some trails lead to waterfalls. Stay is limited to 14 days. To prevent pipes from freezing, the recreation area’s water is turned off when the area is closed. No fee is charged in winter. DAY-USE FEE: $4 per car, $16 for season pass. large shelter: $35 per half day. Offering 18 sites have parking spurs, fireplaces, tables and tent pads. Five sites are for tents only, and 16 sites accommodate RVs up to 34 feet. Two sites are accessible. Drinking water and flush toilets are provided within walking distance of each site. A building with two showers and two toilets are inside the loop. Campers may use Cliffside Lake for swimming, fishing. Stay is limited to 14 days. To make reservations, call 877-444-6777 (toll free); TDD: 877-833-6777; or go to recreation.gov. CAMPGROUND FEE: $16 per night. OPEN: April 1 to Oct. 31. From Cliffside Lake, anglers may fish the shoreline. To fish Cliffside Lake and nearby streams and rivers, anglers must have a North Carolina fishing license and trout stamp. Swimming in Cliffside Lake is a favorite pastime at Cliffside Lake Recreation Area. Bathhouse facilites are available with showers. No flotation devices are permitted on the lake. 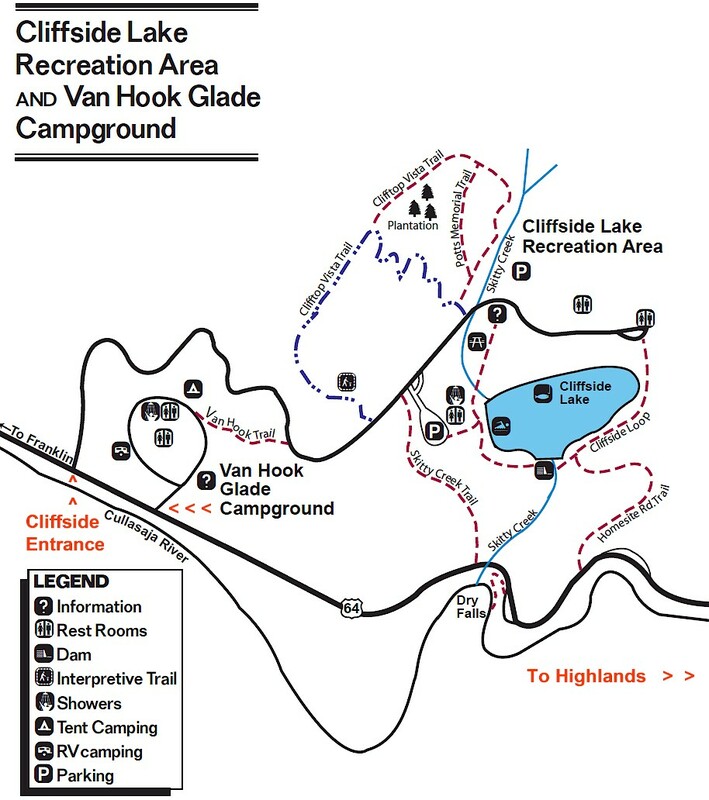 Van Hook Trail: This 0.5-mile trail is located between Van Hook Glade and Cliffside Lake. An additional 0.5-mile walk is next to a road that leads to Cliffside Lake. this trail, rated as more difficult. Clifftop Vista Trail: This 1.5-mile trail follows the same path as the Clifftop Vista Nature Trail. 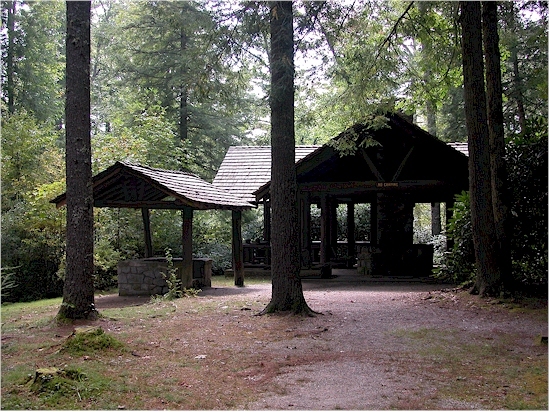 At the ridgetop is a gazebo, the trail offers a panoramic mountain view. After the gazebo, this more-difficult trail continues along the ridge. 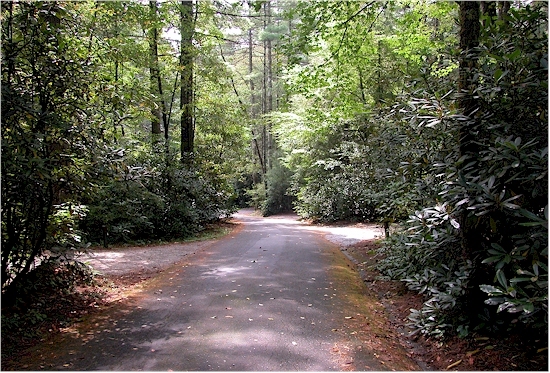 Skitty Creek Trail: This 0.5-mile trail runs between Cliffside Lake Road and U.S. 64. The trail leads to Dry Falls. To get to the falls from the trail’s end, take a short walk along U.S. 64. Watch out for cars along this easy trail. Cliffside Loop: This 0.75-mile trail encircles the lake, passes through the campground, and crosses over the dam and beach area. 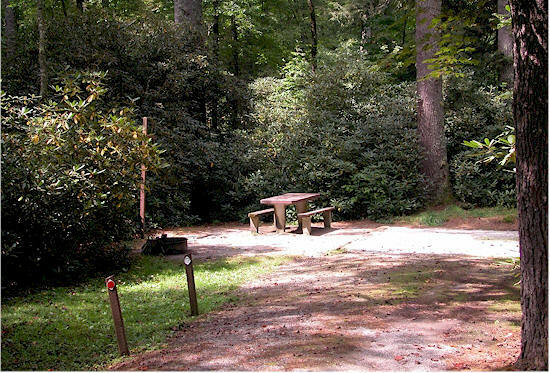 Homesite Road Trail: This easy 1.5-mile trail starts near Cliffside Lake Dam, follows Skitty Creek, and connects with a road that meets U.S. 64 halfway between Dry and Bridal Veil Falls. Dry Falls: The falls is so-called because you keep dry when walking behind a 75-foot waterfall. Reach Dry Falls by following a 0.1-mile trail from the parking area to the falls. This day-use area is open year-round. Find this waterfall off U.S. 64, 2.5 miles east of Highlands in Cullasaja Gorge. Bridal Veil Falls: Alongside U.S. 64, Bridal Veil Falls cascades over a rocky cliff, where it forms a pool of water that flows through a culvert beneath the road to Cullasaja River. A pull-off allows autos to drive behind the falls. The waterfall is very popular for sightseers. No fee is charged. ● Camp only in designated areas. nails into trees or cut them. sure the fire is dead out before leaving. instruments, etc.) on low volume. ● Horses are not allowed in the campground. in a sealed wildlife-proof container. ● Keep pets under control and on a leash. ● Dispose of garbage in provided bins.